Asia has been witnessing reduced monomer supplies stemming from cracker shutdowns across the region, according to ChemOrbis. In response to the supply tightness, spot ethylene prices posted gains in the region amidst higher naphtha costs on the week. However, spot propylene prices softened in the same period as supply from PDH units in the region offset the impact of offline capacities. 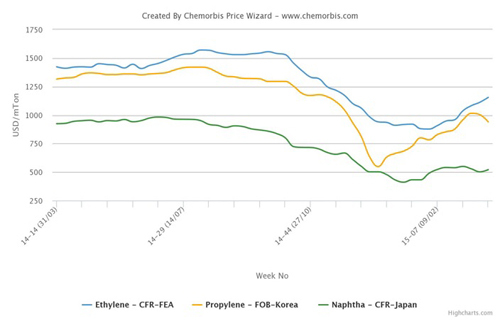 Spot naphtha prices edged down by $25/ton on CFR Japan basis week over week whereas they represented a $40/ton gain with respect to early March. Looking at monomers, propylene offers were down $25/ton on the week while they edged up $10/ton from the beginning of this month. 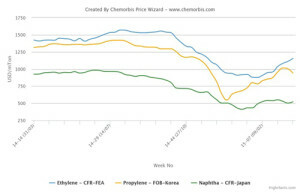 In contrast, spot ethylene costs recorded substantial increases on CFR Northeast Asia basis given reduced availability. Prices rose by around $55/ton in a week while they surged sharply by $170/ton since March started, according to ChemOrbis Price Wizard. In cracker news, LG Chem conducted an annual maintenance at its Daesan cracker between March 15 and April 19. The cracker has a propylene capacity of 450,000 tons/year and ethylene capacity of 900,000 tons/year. BASF-YPC will implement a turnaround in the April-May period at its 740,000 tons/year Nanjing cracker in China. Idemitsu Kosan is set to shut its 374,000 tons/year Chiba cracker in Japan for a turnaround between April and June. Samsung Total will shut its 600,000 tons/year propylene capacity in South Korea for 40 days in April for s scheduled turnaround. JX Nippon Oil & Energy brought its Mizushima FCC offline in March for two months of maintenance. The cracker has 90,000 tons/year propylene production and is slated to restart by mid-May. Mitsui Chemicals kept its 120,000 ton/year propylene capacity offline at its OCU unit in Osaka, Japan since mid-January this year citing market conditions. The unit was supposed to restart by mid-March. Shaoxing Sanyuan shut its PDH unit with a propylene capacity of 450,000 tons/year PDH unit in China for a turnaround in the second half of March.